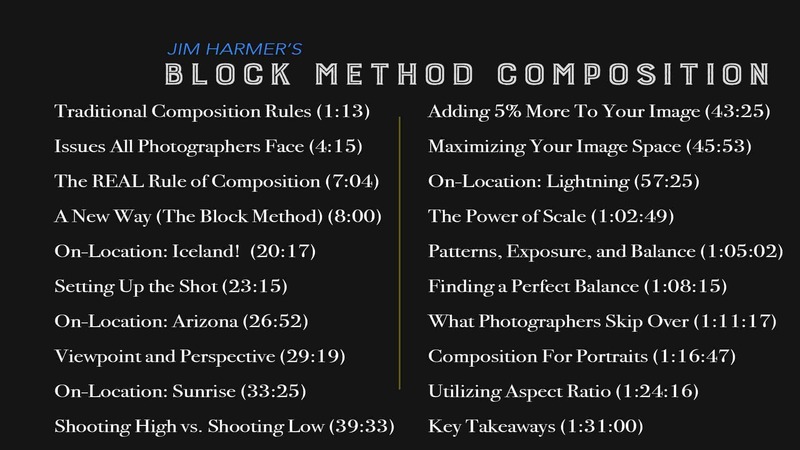 Jim’s “Block Method Composition” is great for any photographer ready to take-on an entirely new approach to taking photographs. Instead of shooting, recomposing, shooting, trying again, Jim shows you how to apply a completely new way of negotiating your images before you even take out your DSLR. Instead of following all of the traditional “rules” of composition, learn what even the non-photographer sees while viewing your work and what truly makes a photograph that is pleasing to the eye. You’ll never approach your photography the same again. Your instructor will take you on location in many of the videos and show step-by-step how he creates gorgeous photographs using this new knowledge! Each section teaches you a new concept, with many on-location shoots so you can see exactly what to do to when taking your own photos. Jim adds another tool to your toolkit with : “Balanced Compositions”, his post-processing techniques to achieve symmetry in your images. The videos (including the bonus lesson) are yours to download and keep forever. Watch them on any device, as often as you like, for years to come. After years of reading books on the subject, researching, and his own trial and error, Jim discusses why traditional “rules” of composition may just be a part of what makes a truly amazing photograph. In Part 2 of The Block Method Training, you will learn about the common troubles of even the most experienced photographer, and how to avoid them. Jim shows you how to get the look you are seeking in a much shorter time. Jim shows us what the Block Method is, as well as why it works so well. Using eye-tracking technology, he shows us what every viewer looks for (even if they aren't a photographer), and how to create the best composition for your photograph based on that knowledge. 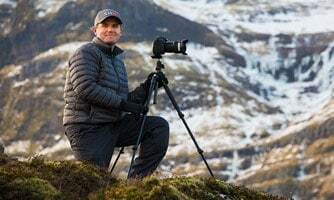 Armed with the knowledge of what makes a truly compelling image, Jim takes us on location while he guides us through his process for making a landscape photo, as three elements that will make ANY landscape work. Everything from color theory to connection and cropping for portraits. All the little elements of a photo you may not think to consider, Jim has you covered!